You're at the CONTRA - WHAT'S THAT ? page. CONTRAS - what are they ? - An English tradition updated with a Trans-Atlantic twist". 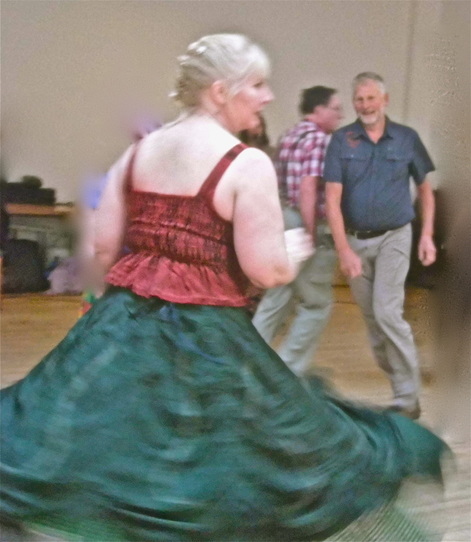 - Todays' contra dances. Find out what fun the experience is ! ​Then share-around - the joy & fun of being at these exciting dances with great callers. Contras are lively, inclusive and friendly occasions. Expect a variety of partners. You're here to enjoy. Partner variety is a great way to pick-up Contra-technique. As well as for Contras, Jen also calls for Ceilidh Dance & Zesty Playford Dances. Do give the explanations below a read-through. Video LESSONS further down this page are ideal for dancers new to Contras. "American ﻿﻿C﻿ont﻿ras﻿﻿" - we often are dancing in energ﻿﻿etic style. View skilled dancing to wonderful, gentle "blues mood" contra music from Brooklyn USA. With various abilities at a dance, a caller will begin by explaining fully. [Probably these dancers are well-practised in this particular style before the video.] Note emphysis on their exchanges of greeting. When most are following the call well: she stops. After a minute and a half, the dancers are moving only to the music. Smooth mode does not mean without extemporisation (note the very skilfully assisted clockwise and immediate anticlock twirl at 1min 52.) Enjoy viewing HERE. Go dance with them if you're in New York. - through its series of moves by our caller. - As you move along those lines which you first formed. - to leave you dancing only to the music ! - without the bouncy step-hops of many ceilidh dances. - often, spins and twirls are added. At a "Brummie Contra" Pic pic by - Mandy - Copyright 2015. - Just try for a fairly good recovery - and all will seem easier soon ! Details next about Contras : then video lessons from the USA ! You and your partner may begin as "ones" ie facing down ﻿in your﻿ starting "hands 4" (your back to the caller) & progress down the set. OR you and your partner may begin as "twos" ie facing up in your starting "hands 4" - you then progress up the set towards the caller. If NEW to this - be sure YOU let yourself get several turns in your same starting direction. To do so, please ASK the other couple in your "hands 4" to helpfully swop, else change into another 4 to allow this. This arrangement (of dancing several turns in your starting direction) is very helpful for yourself as a new dancer at Contras. But it's also helpful for others in your set, to best maintain the dance movements. NOTE: At each end of the set, you often stand (and wait once through the tune). You usually change sides to go back the other way. An ideal opportunity this, to WATCH and to think about the similar moves you'll need in your NEW direction. Rarely, the caller announces a dance in the older style of Proper lines. Proper lines is the way that couples initially form in this American uTube lesson 5 below. All the men start the dance on "the men's side of the set", opposite their ladies. In the UK, we usually form-up ready in Contra lines ie alternate man & woman, started by taking hands 4 from the top of the set. Opposite is your partner - beside in your group of 4 is your contra (or neighbour). 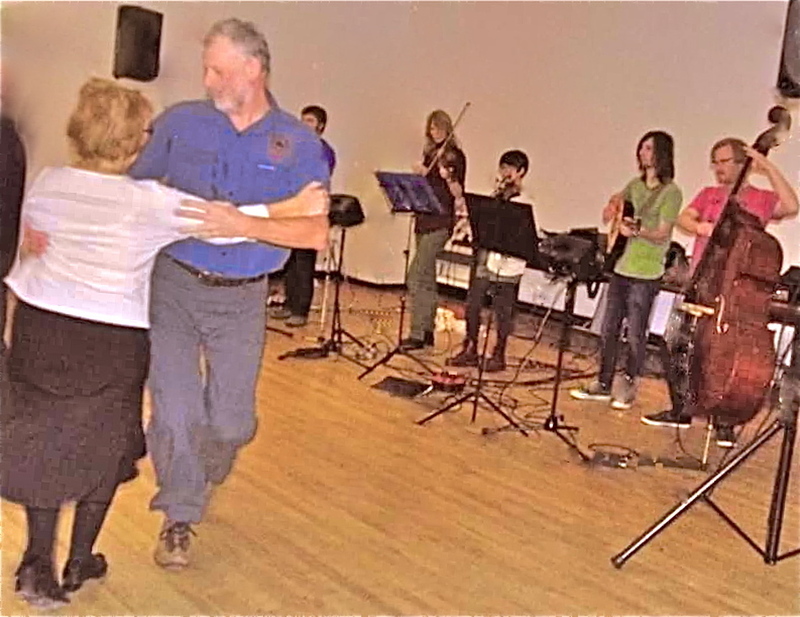 See this all shown & called in an: Easy Contra Dance as the above details are explained in the American video lesson 6. HERE. American video lesson 7 shows more contra moves: the wave across the line (whereas in UK we term this an Ocean Wave). [To differentiate from a "Tidal Wave" where the alternate in & out facing wave formation is all ALONG the set.] Lesson 7 is HERE. In UK Contras we DON'T conventionally extend the "arm around" during the courteousy turn (2nd part) of a right and left through. [BUT PLEASE NOTE - Many ladies DO still prefer a distinct "arm around" - WITHOUT ANY TWIRL - in their LADIES CHAIN. The final video of DANCE BASICS HERE should properly be appreciated, if not also viewed first. Contras are a great occasion for the young and keen. They bring a wonderful and lively vitality to the dancing. Sample the youthful enthusiasm of these American Contra dancers. Fascinating impressions HERE of their widely varied fun, & the inclusive developments around today's Contra Dancing in the USA. Very helpful considerations about Partners in Contras by Steve Harris. - It's a much-recommended read - HERE - also for regular Contra dancers ! The first BRUMMIE CONTRA of 2015. An excellent caller: An awesome, vibrant band . . . . . . . . . . . . . . . . . . . . . . . . . . . . . . . . . . . . pic by - Mandy - Copyright. Pic. Diana dances with Glen. Bob Morgan (the caller) stands behind them. At first, quite a mind-challenge - but a fun, up to date means to help remove discrimination that can result from a fixed male / female mind-set.